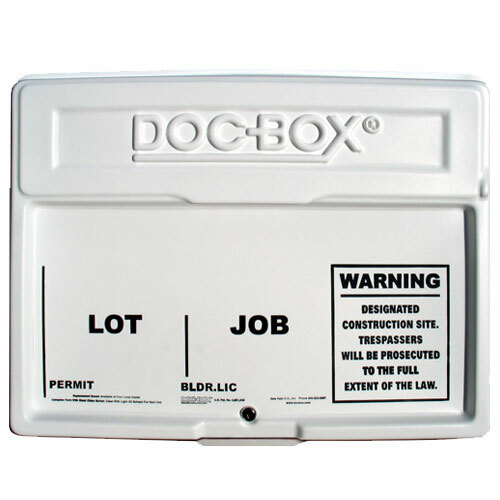 The Original Doc-Box is the ONLY permit box guaranteed not to leak! 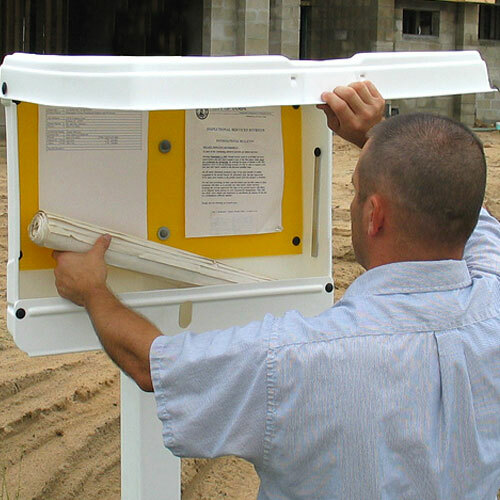 In use for over 18 years and preferred by builders nationwide, all four of The Doc-Box Permit Posting Systems protect plans & permits on job sites. It also acts as job site signage with a warning to trespassers. The inside features a corrugated plastic tack board, an integrated rolled plan pocket and an aluminum prop arm to keep the cover open while in use. The hinges are rated for thousands of openings, and their side mounted location minimizes the possibility of direct moisture entry. The snap lock closure secures the lid and prevents the box from blowing open while remaining accessible (unlocked). The unique flange design is coupled with a deep overlap when closed to provide maximum weather seal. Pre-drilled with self-centering guides to mount on a wall or post, all units include mounting hardware and push pins. Very positive referrals and great customer service! SIZE: 21" x 27" x 4"